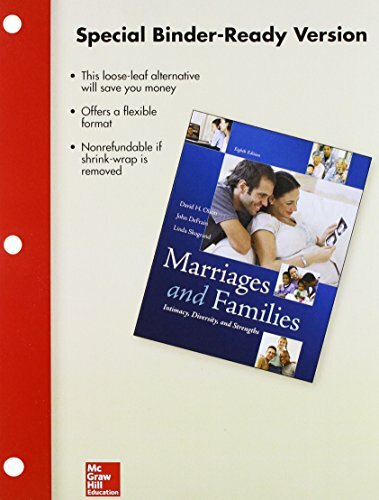 This text combines a positive and practical approach to the study of marriage and family life. It is based on extensive and up-to-date research as reported in the journals and monographs. It shows how sociological theories apply to the various topics. Thus, it not only provides students with a basic understanding of marriage and family life, but also helps them apply this knowledge to enrich their lives and nurture their own intimate relationships. David Olson is professor emeritus of family social science at the University of Minnesota, where he has been for more than 25 years. He is founder and president of Life Innovations. He is a past president of the National Council on Family Relations (NCFR) and a past president of the Upper Midwest Association for Marriage and Family Therapists (UMAMFT). He is a fellow and clinical member of the American Association for Marital and Family Therapy (AAMFT) and a fellow of the American Psychological Association (APA). Olson is also a member of the editorial boards of six family journals. He has received numerous awards, including the Distinguished Contribution to Family Therapy Research Award from both AAMFT and the American Family Therapy Association (AFTA). Olson has written or edited more than 20 books, including Empowering Couples, Building Relationships, Families: What Makes Them Work, Circumplex Model, Power in Families, Treating Relationships, and 10 volumes of the Inventory of Marriage and Family Literature. He has published more than 100 articles with the theme of bridging family research, theory, and practice. Olson and his colleagues at the University of Minnesota have developed the Circumplex Model of Marital and Family Systems and a variety of couple and family assessment tools, including PREPARE, ENRICH, FACES, PAIR, and AWARE. He is happily married to Karen Olson, who has provided companionship and support throughout this and numerous other projects. They have three terrific children (Hans, Amy, and Chris), a great son-in-law (Daniel), and five wonderful grandchildren (Adrienne, Evan, Chelsea, Alex, and Ava). Olson has been blessed with a fun-loving and caring family that continues to sustain and support him.